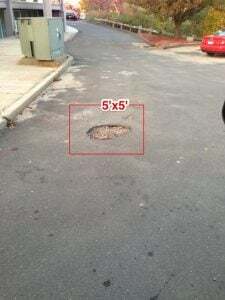 Do I need asphalt repair or replacement? Before we dig deeper into those questions, it is important to understand that the asphalt’s base layer is usually the deciding factor in whether your pavement should be repaired or replaced. But, damages to your base layer may be dependent on your answers to the first three questions posed. Typically, if properly installed and regularly maintained, your asphalt pavement should last 15-30 years. 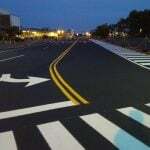 However, the actual lifespan of your asphalt is dependent on a number of factors including atmospheric conditions, traffic volume, upkeep, proper drainage etc. If your pavement is a heavy source of traffic, in an area with extremely bad winters, and not properly maintained, your pavement may have a much shorter life expectancy. In most cases, repairing or sealcoating a driveway that is 20+ years old will only provide a temporary fix, and it may be more cost effective at this point to replace your asphalt completely. Regardless of your pavement’s age, if for some reason your pavement has been severally damaged, repair may not be the best option. The bigger the cracks, and the bigger a pavement defect, the more damage to your base surface. As we mentioned previously, the condition of your pavement’s base layers plays a huge role in determining if your pavement can be repaired or if it is time to repave. In most cases, however, damages can be effectively repaired through methods like patching, and crack filling. Resurfacing is also a great asphalt repair option for more extensive damages to the asphalt’s surface. This involves the removal of the top layer which is then replaced with a new layer. This is a more expensive means of repair and, at this point, you may want to weigh your options. 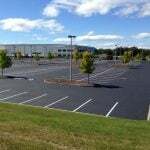 Is it more cost effective to resurface your parking lot, or replace it? 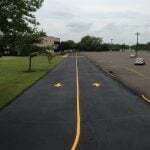 If 25% or more of your pavement’s total surface area needs to be removed, it is generally more economical to completely redo the parking lot. The benefits of replacing your pavement in this situation is that you are essentially turning back the clock. It may be worth the additional cost to have a newly constructed lot that will now last another 20-30 years (provided that it is installed correctly and maintained regularly), rather than investing in large temporary repairs, and continuing the cycle. This is a pretty open-ended question and could encompass a number of different things. Are you looking to just get another year or two out of your pavement and invest in a repave in the near future, but not quite yet? Are you hoping to restore your pavement so it is like new? Are you thinking of changing the material all together? The list goes on for this question, but it is important to sit down and analyze exactly what your goals are before ultimately making your decision. Your professional paving company can help to better determine the best course of action for your pavement depending on the condition of its base, it’s age, the extent of the damages, and your overall goals. Ultimately, the best way to ensure that your pavement is lasting as long as it should is regular parking lot maintenance. This allows for you to repair any minor cracks or damages early before they turn into bigger problems and ultimately lead to base damage. 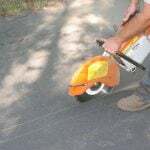 The best way to determine whether your pavement needs to be replaced or if repair is still a viable option, is to have a professional inspect your asphalt. We can help you choose the best, and most cost-effective course of action for your pavement. Contact EastCoat Pavement services for your free consultation today!